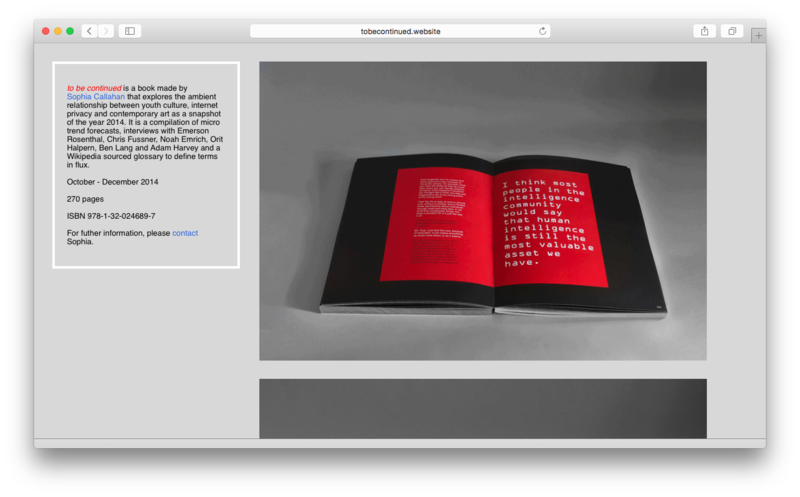 Post-Snowden Aesthetics is a 270 page book that explores the ambient relationship between youth culture, internet privacy and contemporary art as a snapshot of the year 2014. It is a compilation of micro trend forecasts, interviews about art and technology, alternative networks, smart cities, US Defense intelligence and surveillance art. The book includes interviews with Vice's the Creator's Project Editor, Emerson Rosenthal, Mesh Net NYC Researchers, Chris Fussner and Noah Emrich, Historian and big data theorist Orit Halpern, past US defense intelligence solider, Ben Lang and Contemporary Artist, Adam Harvey. In the back of the book there is a Wikipedia sourced glossary to define terms in flux that are used in discourse to define the internet.